One of the earliest high alpha hops in the world, the Bullion Hop was raised in 1919 in England from a wild Manitoban female crossed with an English male hop. It is used mainly in bittering Stouts and Dark ales. This variety thrives on all types of hops soils, it makes very vigorous growth and has a tendency to be overcrowded if not trained adequately. Growth of full bine should be restricted to one per string. The usual procedure is to initially train two bines, to allow for casualties and then, in late June to cut off one of them at its base; it is unnecessary to remove the cut bine from the string. The plants also need wide spacing, about 7ft x 7ft, and high wirework, 16ft to 17ft high, for their proper development. The extraordinary vigour of the plant makes it possible to furnish unoccupied strings with laterals which, when trained, attain nearly the size of the main bine. The compact, bold cones are very rich in resins. This hop has a strong earthy aroma that is evocative of bruised blackcurrant leaves. 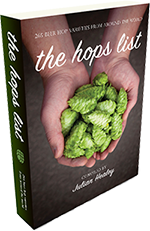 The popularity of this hop is increasing as microbrewers favour the strong individual flavours.